Should we be scared of robots or not? If you’re in a field where robots are being introduced, this is probably a question you’ve asked yourself. Some people are understandably afraid of losing their jobs; machines are obviously clearer, more organized and even smarter in some ways. However, we at Diatom believe that people have nothing to fear from robots. We think they are created to help us, assist with difficult things and be companions, team members or friends… but not to replace human beings. In that regard, recently, we were asked to present a lecture on automation and robotics to a company called “Elfa Distrelec SIA”, a Latvian office of an international company distributing electronics, automation and measuring equipment and tools. The company is currently considering whether some tasks and workers’ duties can be shared or transferred to machines with artificial intelligence or be replaced entirely by automation. Robot Pepper participating in the presentation devoted to robots and automation. Diatom representatives gave a short overview of various examples where automation and robotics had been successfully implemented in businesses. One of the examples, which gave people greater perspective, was about email. Imagine what it would be like if we needed to deliver all of our emails physically. It would be horrible and extremely difficult for business to develop in that situation. Another example of useful automation is technology for pilots; most of the time an aircraft is in flight, the plane is controlled by automation and pilots use their skills only on landing and take-off. Introducing automation during the flight saves the energy of the pilots, so they still have the attention and mental resources necessary to act in non-standard or dangerous situations, which could possibly save lives. Another point we discussed was that there are certain jobs that are less likely to be affected by automation than others. In the figure below, you can see that jobs that require a personal touch and the ability to empathize, like mental health workers, have the lowest chance of being affected by automation. If we consider the reasons behind automation, we can see the common answer in five words: to make our lives better. Automation was intended to make our lives better so that people wouldn’t waste their time on boring and routine tasks, but rather bring value to the world by achieving the more complex things that robots can’t. In this respect, automation is a way to expand human potential. 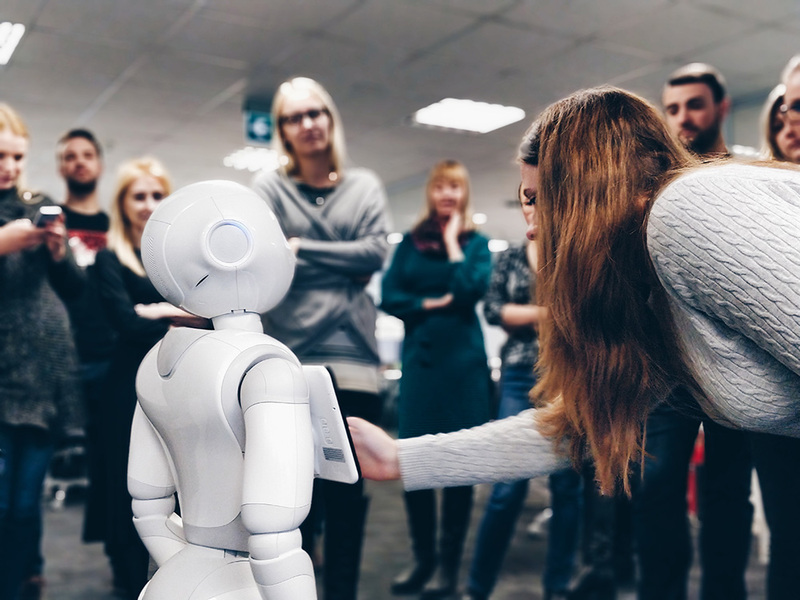 In addition, this partly philosophical presentation was conducted with Diatom’s companion, Robot Pepper, in order to demonstrate a real example of how robots could take on work made for humans. Recently the Diatom team collaborated with Radisson Blu to create a special application designed for hotels. It allowed Pepper to help guests with the check-in and check-out process. In fact, we tested visitors’ reactions, and their interaction with Pepper positively affected their overall satisfaction rating. Robot Pepper proved to be a great help for hotel guests, giving them information about breakfast times and locations, telling them about popular attractions in the city and near the hotel, and helping them book a parking spot near the hotel. Visitors agreed that interacting with Robot Pepper made the overall experience of visiting the hotel more positive and engaging. To sum up, how should you prepare yourself for the changes coming with the automation of work and the thriving robotics industry? Diatom has come up with several ideas, one of which is to prepare yourself for hybrid careers – those that include different areas of experience, e.g. merging finance and technology. Even at Diatom, there are developers with a background in accounting, finance or marketing who can find mistakes in code. The fact is that 20 or 30 years ago, you only needed to know one industry. Now, you need to be proficient in two or three. This is the only way that companies and individual professionals will be able to adapt to globalization and overpopulation and take the best from what automation, robotics, and AI have to offer.